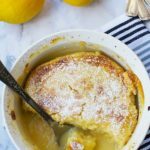 They’re full of rich, lemony flavour, they’re soft and creamy on the inside and lightly crispy and caramelized on the outside. 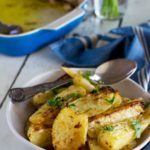 I rarely claim a recipe is ‘the best’, but I really can’t imagine better Greek potatoes than these! Potatoes done the Greek way are a mainstay of the average Greek kitchen. If you’ve never tried them, you truly are missing out. 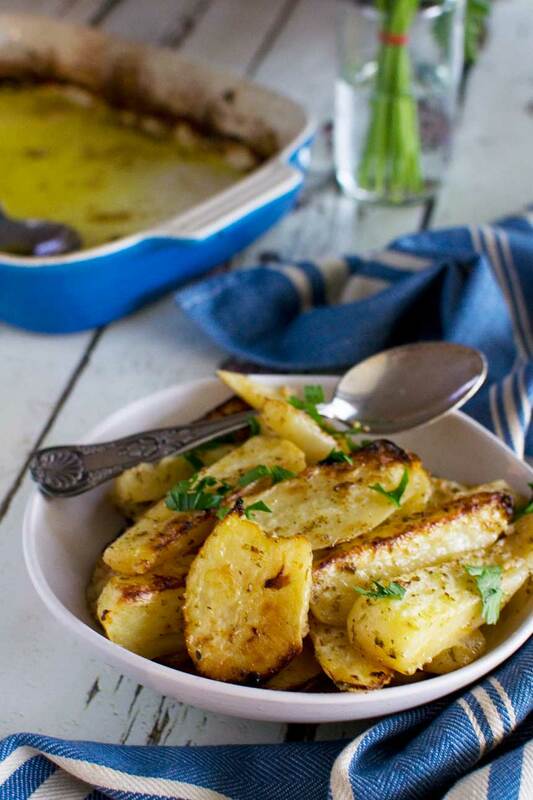 Some of the best Greek dishes are cooked slowly, and these potatoes are no exception. They take about an hour and a half to cook, but they are EASY. 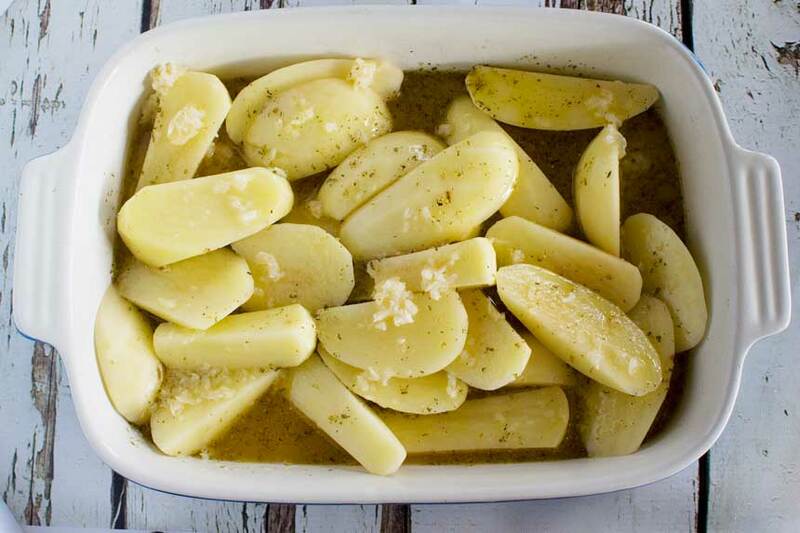 Simply cut potatoes into thick wedges, tip into a baking dish and pour over stock, olive oil, lemon juice and oregano. Bake for 45 minutes, stir well, then bake for another 45 minutes. I think the only other recipe I’ve dared to call ‘the best’ was another potato recipe – cheesy roasted cauliflower mashed potatoes, if you’re interested. They’re a perfect Thanksgiving or Christmas side! Generally I’m a bit afraid to claim that something is ‘the best’. But these potatoes… wow. I didn’t hesitate. So what makes them so delicious? One secret is a common one used by the Greeks – olive oil, and lots of it. So don’t be shocked by how much oil is in this recipe. Remember you won’t be eating the whole pan by yourself. But I won’t judge you if you do. And anyway… HEALTHY FATS! The next little secret is in the stock. 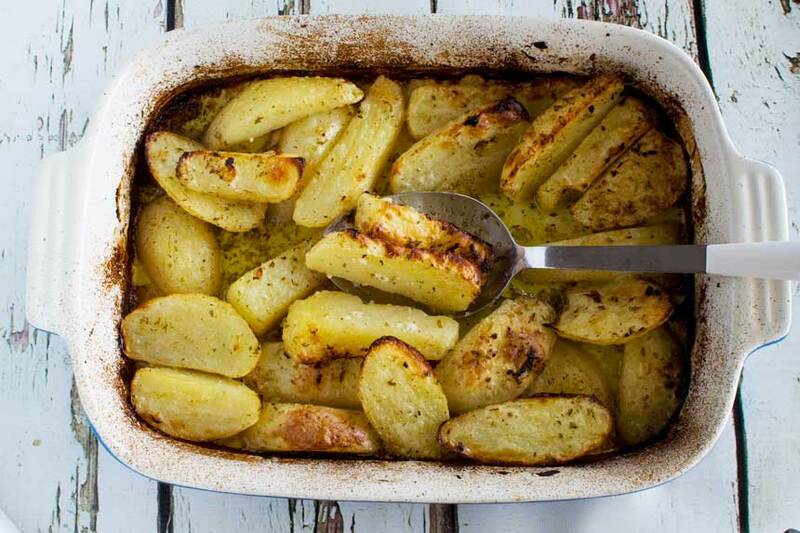 Because the potatoes bake in some liquid, they are beautifully soft and creamy inside. But because you don’t completely cover the potatoes with liquid, they still end up quite crispy. There’s also garlic and lemon juice, and we don’t hold back on these either. Just throw generous amounts of both in. Combined with a bit of salt, all this gives you a gorgeous umami flavour. 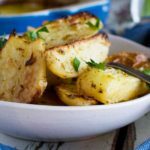 Besides these Greek potatoes being the tastiest potatoes you’ll ever eat, they go with so many things as a side. I often make them alongside Greek meatballs (recipe coming soon! ), salad and Greek yogurt – just because I’m too lazy to make tzatziki! 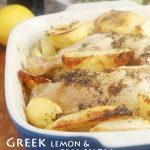 Another easy and delicious Greek meal, this time with chicken and potatoes! BUT the possibilities are endless. Supermarket rotisserie chicken goes really well as does any grilled or baked meat, easy moussaka, fish, or vegetarian options like this favourite baked eggplant. I also find these potatoes can be casual or fancy. 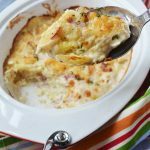 They’re easy to prepare on a busy weeknight, but they also make a fantastic side to serve to guests. Go on, get them on your Thanksgiving or Christmas table! Oh, and rule number one – don’t forget to scrape the pan to get the super dark and crispy caramelized bits. Trust me, it’s criminal to leave those behind! These Greek potatoes truly deserve to have the words 'the best' in their title. They're tasty, creamy, and crispy all at the same time, and go with anything. You might find yourself eating the whole pan to yourself. Don't say I didn't warn you! These potatoes look absolutely delicious! Your video was helpful to show the stages of cooking and what they should look like when they’re done. YUMMY! 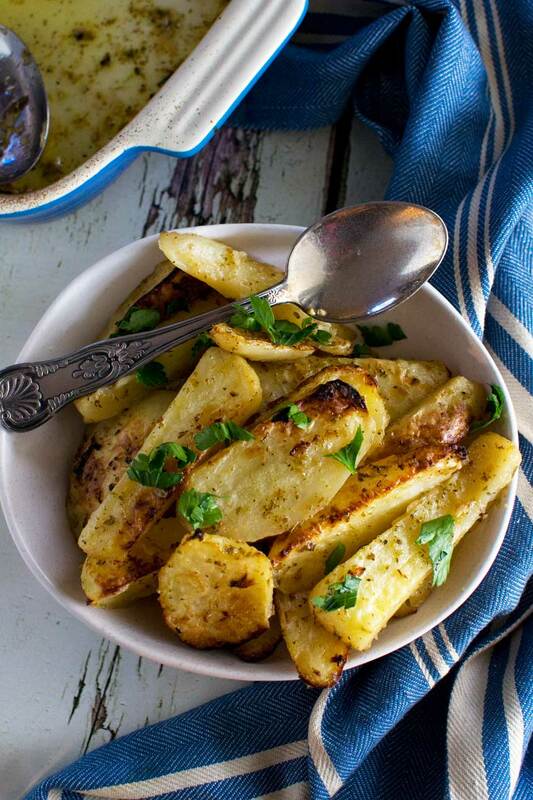 Love Greek foods and these potatoes look fantastic! Great video, definitely going to try them! Thank you, Mira. I think you’ll love them! You had me salivating at the ‘scraping of the crispy bits off the bottom of the pan’ because I am the cook who will eat those as I’m serving. 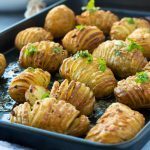 These potatoes look so good, I have to try them. YUUUUUUM! Forget about eating these potatoes as a side dish, I want them as the main dish! I adore greek flavors so I’m all over this recipe! It looks and sounds so freaking amazing! Hi Grace! Thank you so much for taking the time to rate this recipe. They really are good, aren’t they? I love what you garnished them with – I’ll have to try that. I may be making these again for Easter! I cannot wait to try all your Greek recipies!!! My fathers grandparents came to US from Greece, but as they passed on before i was born, I never got any old family recipies or anything & I absolutely love Greek food (I guess it’s in my genes, I’m supposed to like it!) . Until now all I’ve ever come across were recipies for very americanized versions of Greek food & not good. I will comment back after I get a chance to make these delish looking tatos! Hi Amie! Yes, definitely in your genes to like Greek food, by the sounds of it! I absolutely LOVE Greek food. I love the simplicity, and the fact that the recipes feature a lot of healthy veggies. I really hope you like the potatoes! Please do pop back and let me know! I’m part Greek and make Greek dishes all the time, but have never made Greek potatoes on my own. I’ve had them, of course. I’m making Greek style (lotsa lemon and herbs!) Cornish hens tomorrow night and potatoes. I’m only making a small version of my favorite Greek salad (Horiatiki, Greek village salad, always have feta, kalamatas and peperoncins on hand), since I only have tomatoes and cucumbers, no green bell pepper yet 🙁 and I dislike raw onion, currently fresh from my garden. Good luck with the recipe, Cori! It sounds like you like Greek food as much as I do! Do you think they would still be as good if baked ahead of time the night before as per your directions and then reheated the next day ? Hi Jade! We do sometimes reheat leftovers and the potatoes still taste absolutely delicious. You do lose some of the crispiness though so for the best results it is best to cook them just before eating. 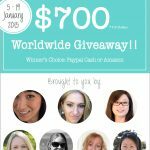 Let me know how you get on! I am doing a Greek theme for my daughters baby shower. We are going to have around 50 people. We are going to have chicken kebabs, salads and I hope Greek potatoes! Would this one be too hard to do for that many people? How many potatoes would I need? Could this be made the day before and still be good? I am not a cook! I actually don’t really like cooking but want this day to be special,. Trying to keep the cost down too. How would I do this? Thanks for any advice you have. Do you have other Greek side dishes that are not too hard for 50 people? Probably cold dishes? As for the potatoes, I have reheated them before and they were still delicious. It’s just that you would lose some of that lovely crispiness you get when they’re straight out of the oven, so if you can make them on the day then that would be best. It’s OK if you eat them at room temperature though if you want to make them a bit ahead – Greeks do that all the time! Now this is an estimate, because I’ve never made these potatoes for a lot of people before, but I’d suggest you make about 6 times the recipe for 50. Remember people will only have a few as they’ll have all the other food too! 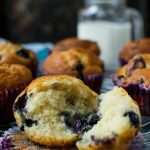 Make them in the biggest baking dishes or baking trays you have! It doesn’t matter if they get stuck to the pan a bit – even tastier! I have a few side dishes in the Greek food category on my blog. I’d suggest a couple of simple dips, which are very easy to make if you have a food processor. You could also think about making some of the little feta and spinach parcels. You definitely can make these ahead and cook just before (instructions in recipe!). Lastly, put dishes of Greek yogurt on the table for people to use as a sauce/dip. It goes so well with everything else! You could make tsatziki but that takes longer of course. 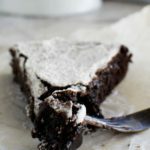 I just use Greek yogurt! Good luck, and if you remember please let me know how you get on! P.S. Oh and you might need to cook the potatoes a bit longer for a larger amount. Just check before taking out of the oven! Thank you so much! The shower is at 12:30. If I cut all the potatoes the day before and soaked them in water ( does that work?! ), and bought two large tin pans from the grocery store, can I cook them the next day? I don’t want soft/soggy potatoes. I just don’t think I can peel and cut 50 potatoes on the day of the shower. I will be doing other things… But do they need to be peeled? I can probably cut them and cook them. Peeling, no way! Please let me know. So for 50 people, does that mean taking your recipe and x’s by 10? I found this one recipe for Greek broccoli salad. I love raw broccoli but do most other people too? I think I am afraid that I won’t have food that everyone likes. I will also have the traditional Greek salad. I am thinking I will have 3 salads. I will also be ordering some chicken skewers from a local restaurant. Thank you so much for your help! Hi Karen! They’ll be OK overlapping a little bit, but not too much. You just don’t want them all piled on top of each other too much. Take a look at the video in my post to see how I do them. Do you have time for a trial run before the shower? Why don’t you make them just for yourself to see how you like them? You could even reheat some leftovers to see how they turn out. Hi Karen! You know what, I think your buffet is going to be amazing – you shouldn’t worry about everyone liking EVERYTHING. There will be some people who don’t like raw broccoli but that’s OK – they will ALL like the chicken, salads, potatoes etc.! Cut the broccoli up into small pieces and I think that will help. As for the potatoes, I think you’ll be absolutely fine to prepare them the day before and keep them in water in the fridge. Just dry them off well with tea towels or paper towels before you put them in the baking pans. I also think you’ll be fine not peeling them. They’ll be a bit different to mine, but that’s OK! Honestly, these always seem to come out well. They might be a little more or less crispy, but they aren’t supposed to be SUPER crispy anyway, you just have a few crispy bits where the potatoes have stuck out of the liquid. Just make sure they’re done before you take them out of the oven of course (just because there will be more than in my original recipe). I think you could times my recipe by about 5 or 6 and you’ll be fine with that. Remember this is just going to be a side dish. So long as everyone gets a few bits of potato, and you have some bread on the table too, you’ll be fine! Good luck!! Don’t worry too much – it’s going to be delicious!! Thank you! Yes, no worries. I will try and do a trial run. Thanks for your encouragement. Much needed. I just really want to celebrate this beautiful day! And I want to have fun! Please do, if you remember (no worries if you don’t!). I really hope everything turns out as you’d hoped and you have a wonderful day. Don’t hesitate to ask anything else you like! The most insane flavours in my mouth ! Wanted to polish off the whole lot but had to feed the others (rolls eyes) tastes just like the ones I had in Greece ! Oh, those pesky family members, hey?! I recommend you make these again when everyone’s out, Louise, and eat the whole pan to yourself. I will give this a try on the weekend in Syros . Thank you, Brian! Let me know how you get on! Syros is beautiful! 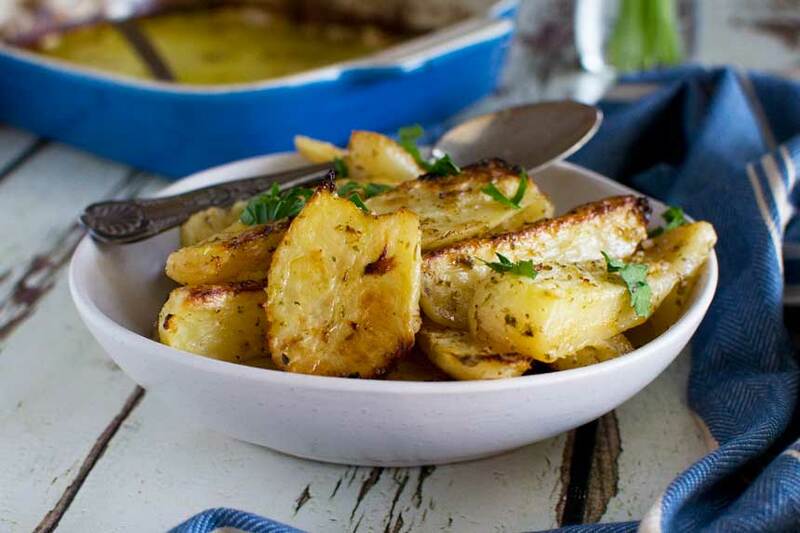 I made your recipe for Greek Potatoes tonight and they ARE the BEST! Thank you for this simple and delicious recipe, I’ll be making it regularly from now on. Thanks for the recipe. We just came back from Tinos and Naxos and are hosting a dinner party for friends with a Greek theme. These sound delicious and just like some of the potatoes we had in the islands. Hi Ken! Oh, how wonderful! I lived in Greece for many years and loved Naxos. Sadly I never got to visit Tinos – maybe sometime in the future! I really hope you enjoy the potatoes as much as you enjoyed the ones you had in Greece. I LOVE these and we make them all the time. Thank you for the review! I can’t find a link to the video for this delicious recipe. Help! Hi Dominique! Oh, that’s strange! I’ve just moved the video to just below the recipe, so hopefully you’ll be able to see it now (or if you’re using a desktop computer it’ll be at the top of the post). I tried these potatoes after trying lots of different lemon potato recipes online and WOW. Just WOW. I don’t want to have potatoes any other way! Thank you so much. Aw thanks, Susan! So so happy you liked them! In fact I must make them again soon. They go with so many things, but especially other Greek dishes! Have you tried my Greek chicken and potatoes, too? The potatoes turn out similar, but with the addition of chicken of course. 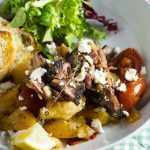 Wonderful meal with a traditional Greek salad (you can also find a recipe for this on the blog). Thanks so much for leaving your review! Both the video and the picture make me craving. I have to make greek potatoes as soon as possible! Thank you for your tips. We tried the recipe last night for dinner, it was excellent. Definitely 5 stars for flavour and ease to prepare. However, I do have one big concern – we’re trying to eat healthier and at first glance your calorie count looked fine, but this morning when I went to print the recipe, I looked at your Nutritional Facts panel and noticed it doesn’t make sense. It shows a serving to only be 35g (30g of fat and 5g of carbs)? The actual calories are seriously understated. The site I use (happyforks.com/analyzer) shows a serving as having 430 calories, about 50% higher than you state. We loved it and thought we’d make this a regular side dish, but for my wife, one serving is about 1/3 of her total daily calorie target. I’ll need to tinker and see if I can figure out a way to reduce the calories (which really that means reducing the oil level) while keeping the taste to have this as a regular dinner item. Hmmmm…. thanks so much Gary for the 5 star rating despite your concerns about the calories! Also thank you for bringing this to my attention. Clearly as you say something is not quite right with the calculations. I’ll take a look and see if I can get it reflecting the actual calories in a serving…. It’s actually quite difficult to calculate the nutritional info for a recipe containing a lot of oil because you don’t actually ingest all of the oil in the dish. Greek food is generally quite olive oil-heavy – they don’t hold back! P.S. 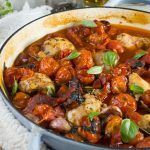 You might also like my Greek chicken and potatoes recipe? There’s less oil in that one but you end up with similar potatoes. Also it’s very easy to reduce the oil a bit if you like without affecting the final result too much. Good luck! Hi again Gary! I just took a look at the nutritional info and reset it (without changing any of the amounts in the recipe) and it looks like the info has changed. Goodness knows why/how, but it is now reporting 390 calories in a serving, 27g of fat (3 saturated) and 33g total carbs. Is this a bit closer to what you would expect?? If this still seems unacceptably high for your wife, it might be worth reducing the amount of oil by about half (maybe addd a little more broth to compensate for the lower amount of liquid) and see how you go? They look really attractive. Best of all, the recipe is great, it makes me do it very easily. Thank you, Marissa. I really hope you enjoyed them!